Day 1: Delhi-Manali 570 km. Arrive from Delhi Railway Station/Airport/Bus Stand by exclusive vehicle. 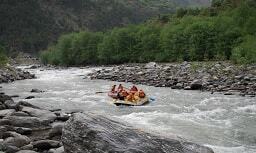 Drive to Manali the valley of Gods, Manali is a combination of natural splendor and rich cultural heritage. Enjoy the Scenic Himalayas and the Beas River from the window of your cab.On the way you can have a stopover at Pandoh Dam on River, Sunder Nagar Lake, Beas and Kullu if time permits. It will take 14 to 15 hrs to reach Manali and the distance is 566 kms. The cab will pass through Panipat, Kurukshetra, Ambala, Chandigarh, Bilaspur, Sundernagar, Manali and Kullu on the way to Manali Over night stay in Manali. Checkout from Hotel and drive towards Delhi , Before going to Delhi We will Take to You Jagatsukh sightseeing & Naggar sightseeing. Dropping at Delhi Railway Station/ Airport for onward journey.